Not only because its the closest. But its also very affordable, with nice facilities, helpful staff and decent food (and menu). You can swim right off the property, but its really a great place to take in the magical surroundings. Its also small enough to be quiet and personal. i travelled with my partner and our five year old daughter. El portal is rustic (like all the places nearby ) but we had a lovely room overlooking the river and really enjoyed our stay. We loved being so close to semuc champey, it was an easy walk and a guide was not needed. semuc champey is fabulous definetly one of our highlights of our time in guatemala. recomend booking in advance in this area . you are remote there is no shops or internet nearby. This place is located perfectly beside the park, not like all the other hotels. this allows you walk to the pools when ever you want on not be depended on shuttles. More then that- the hotel is located in a beautiful spot, above a river and the place is just gorgeos. You will get a great value for your money over there, in our opinion. but what really makes the place a positive expirience is the people, and the people who runed the place when we visited were more than great! they were so helpful, did everything they could to make us feel comfortable and were just honestly kind and friendly. We had a really good time there and stayed a night more than we planned. It's a cute little hostel out in the middle of nowhere, right outside the gate to Semuc Champey Park. You can't beat the location and the staff (it's Guatemalan owned & operated) is very friendly and helpful. They have inner tubes to rent and you can swim in the river right next to the cabins. The caving trip that's part of the full-day tour the hostel offers is an absolutely AWESOME experience, and if you had the swimming in the cave and one day to relax. Don't expect anything fancy as far as amenities. Even by hostel standards it's very basic; cold showers, electricity only from 6-- No internet or phones, and rather hard uncomfortable beds, but at least they had beds and not just hammocks. That said I really liked the place and would definitely stay there again if I were to revisit Semuc Champey. They have private rooms, dorms Small cabin near the river. . It was well worth themoney we paid, it's a nice, peaceful place to hang out, and you can't beat the view. 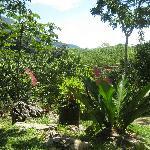 Fantastic Hostel- Friendly, fun but remember- its in the Jungle! I find it hard to believe that anyone can offer anything but praise for El Portal. 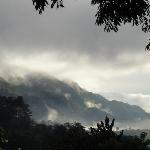 It is in a stunning location, perched on the hillside in the middle of the forest, right where all the tours run from. The staff were friendly, knowledgeable and helpful. Best of all they were local people so you got more of a feel for the place. We arrived in Lanquin and immediately hopped on the truck to the hostel. It was incredibly bumpy as other reviewers have said, but this journey would have had to be done by any visitor to the area at some point, as it is the only way to get to the incredible pools and the exhilarating cave tour. There is no point in going to Lanquin if you don't do these tours, it is the sole attraction, thus the truck is a necessary evil (although I found it to be quite enjoyable, certainly not something I have ever done before!). We arrived just as the rain started and managed to put our things into our room before the downpour started. The first room we stayed in was a dorm, it had a double bed and a bunk bed. There was gauze across the windows and it had its own small shower and toilet. There were very few insects that could get in, but you must remember that this is in the jungle and creepy crawlies are to be expected. The next morning we moved out to a slightly cheaper dorm, as we were both on a budget. This dorm is exactly as described by other travellers. It was up a few steps and completely open- it was amazing. We had brought mosquito nets (as is recommended for all of Central America- they had been invaluable the entire trip..) and therefore had no problem with mosquitos. Every morning we woke up with the sun shining in, and the birds chattering away. Dinner was served at 7 every night, and the menu was quite extensive. The food was lovely and it was nice as it employed Guatemalan people from the surrounding area so you know that the food is authentic. They even had mashed potato, which made me very happy! 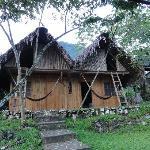 I would urge people to remember that El Portal is an Eco-Lodge. This means that the electricity is on for only a 4 hour period in the evening. Also you must remember that it is nestled in the jungle there WILL be creepy crawlies! The same goes for any hostel in the area. I was completely shocked when I returned home to find the other reviews about it, I absolutely loved it and I have no qualms about saying that it was certainly my favourite place in Central America (through 8 weeks from Panama to Belize). We already had a reservation for El Portal and were happy about the pick up service from Lanquin. Since it was raining they took us to a cafe in Lanquin to wait for the shuttle arriving from Flores before the fun ride to El Portal started. The ride was spectacular.If it hadn't rained I would have climed in the back of the pick up, but they covered it all up, that our backpacks wouldn't get wet. Our reservation went well and we did settle in our private room with bathroom and hammock on the porch. The room was clean and the matresses great! And the whole hostal is just like paradise! The dining room upstairs is a wonderful meeting place and the dinner is served like a big family dinner. You don't have to worry about money since you pay everything when you are leaving (be sure to bring enough money). Electricity is from 6pm till 10pm only but after that they sometimes set up candles and what else do you need? The staff even tries teaching Salsa to you if you want and they are really helpful and friendly. They help you as well set up the next transfer to where you want, taking you there in time! As a resume it was the best hostel we stayed in during our trip. I loved it there and dream of going back!